It has been a CRAZY two weeks and I haven’t had much time to do anything at all. However, yesterday I had some free time and spent it looking for last-minute stuff for my trip to Vegas next week. I have a few outfits already packed but still wanted to see what was hiding in some of my favorite thrift stores. I needed some cool pieces, a new half wig, and comfortable shoes. I found lots of cool stuff, most I never got to document because I ran errands alone but for the most part I think I got some good photos of my outfit. 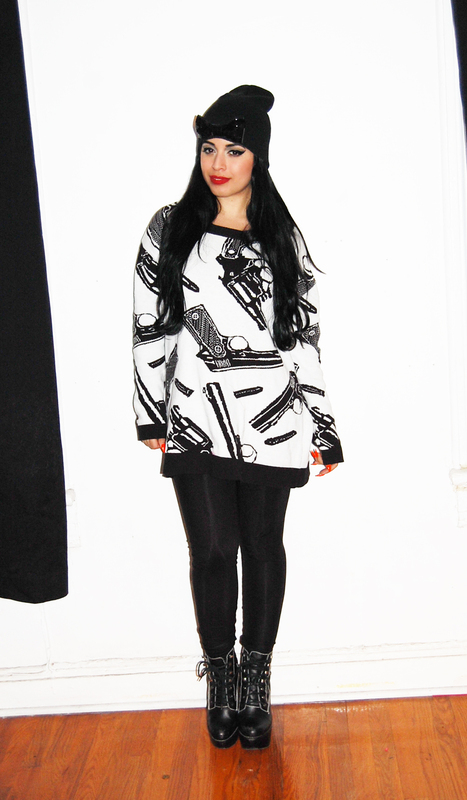 I got some goodies at the Betsey Johnson sample sale last week and couldn’t wait to wear my new gun sweater. 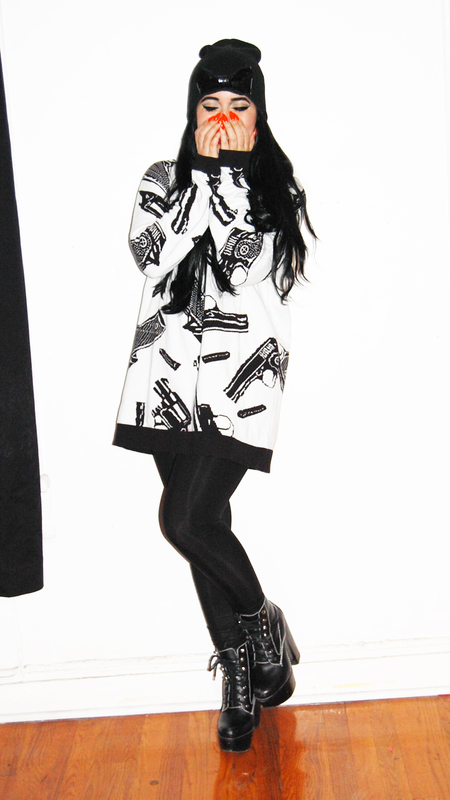 I am sure many of you have seen my entire gun collection of Betsey pieces, I own a dress and cropped sweater in this print as well. 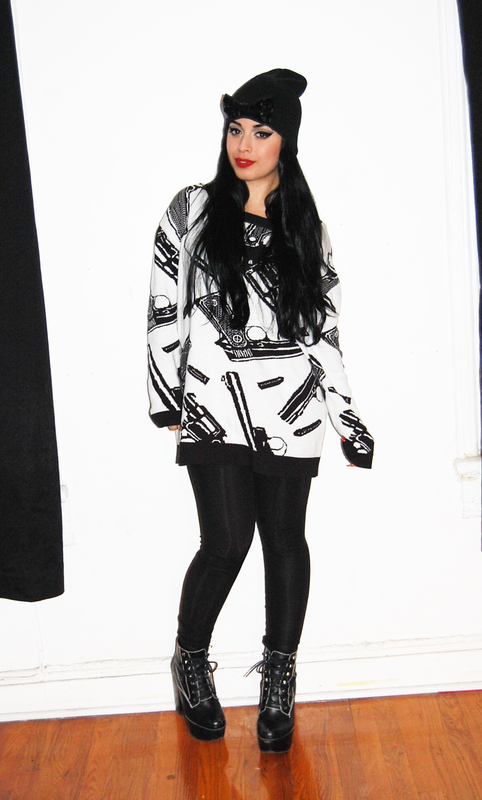 It was my favorite print of all of her sweaters. 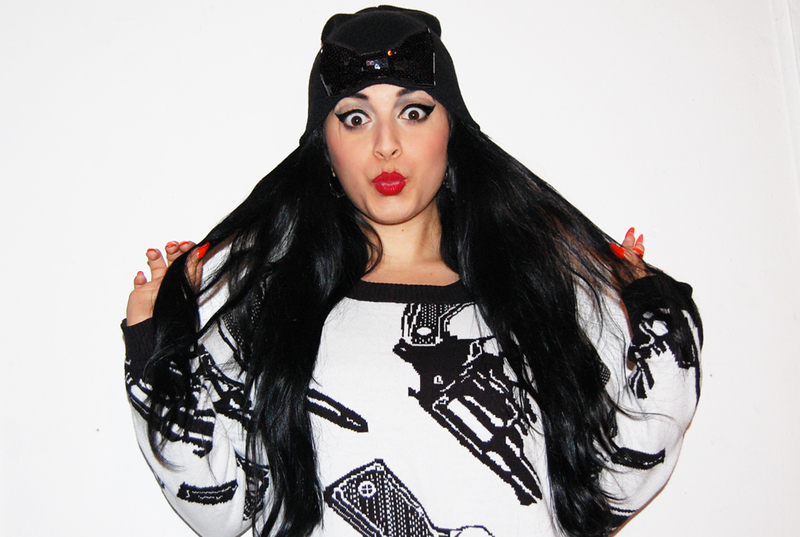 I also wore my new Gla.mar.ous sequin bow beanie that was the perfect sprinkle of swag to my outfit. Since I received it in the mail, it has been my go-to hat for everything. I absolutely love it. My leather jacket is old as hell and from Zara and my leggings are from American Apparel. My boots are by Jeffrey Campbell and I have worn them to death because I love them so much. Check out more pictures of my day and my outfit inside. How cool is this Gla.mar.ous hat! So cute! Get yours here! I found a bunch of cool pieces at Reminiscence on 23rd street like this vintage leopard crop top! I also found zebra petal pushers too! I LOVE that place. 2nd stop Wigs Plus on 14th Street. 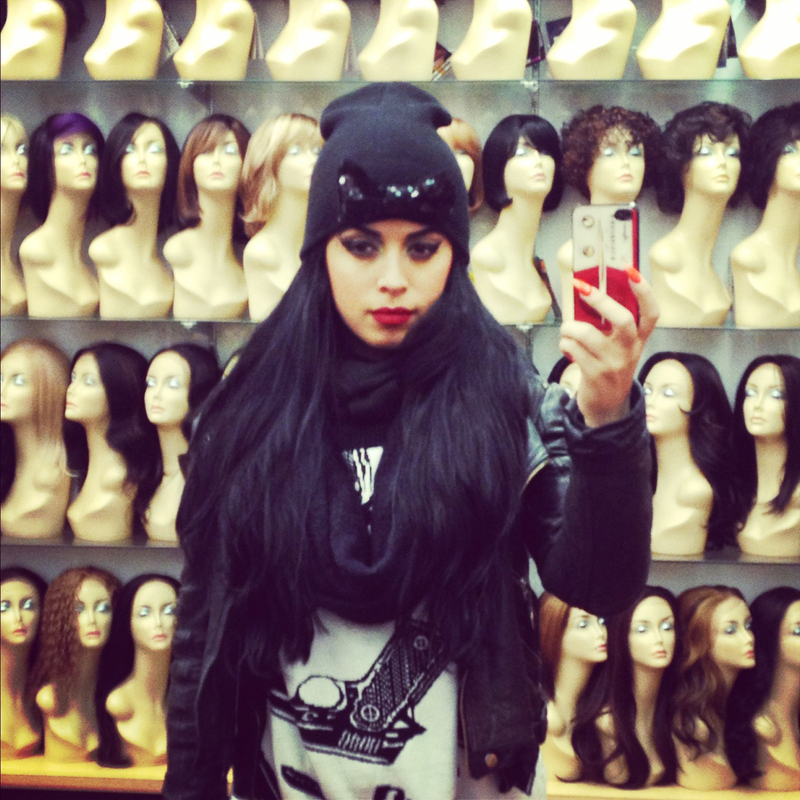 This is my go-to spot for my wigs and hair products. My cute but deadly look 😀 Babe kept making me laugh. My nail color is “Orange Punch” by Orly. I wear this color all spring and summer. I never get tired of it. 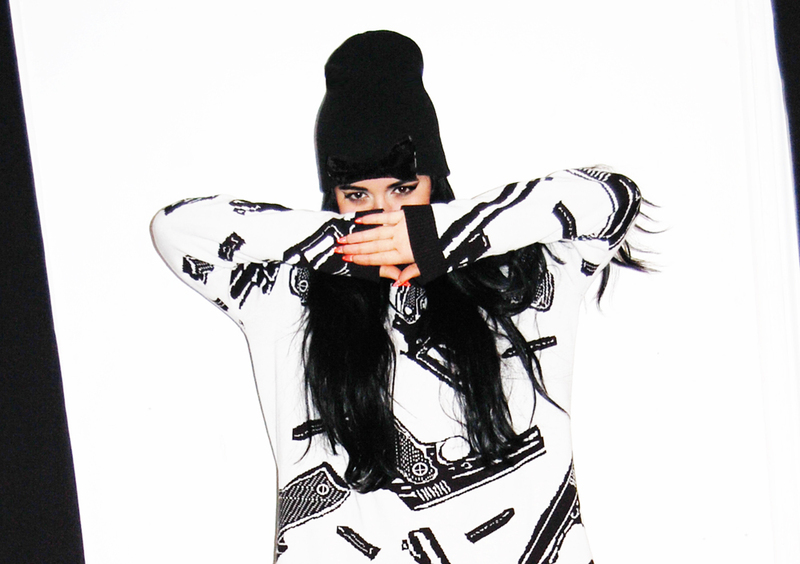 ← Mala Reignz “Make you smile” video Styled by V.V! Love the red lipstick! It has to be the best statement for black and white. 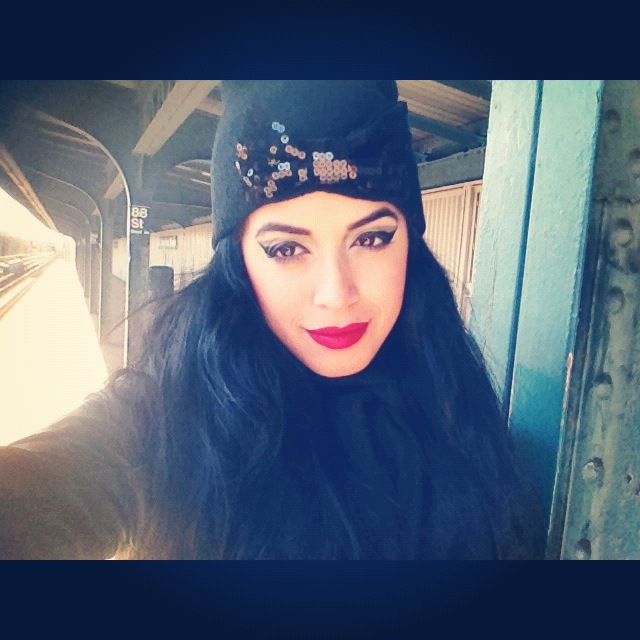 U look very cute with your red lipstick. My favorite is your jacket from Zara.